Last summer, I was perusing Aldo's end-of-season sale and found a pair of purple sequined ballet flats. After recovering from my heart-attack-due-to-awesomeness, I ordered them. When they arrived, I was SO happy with them that I ordered another. You know, because sequin ballet flats don't exactly last long. Especially when there isn't much of a sole and absolutely no heel. I wore the first pair until they looked awful and then broke out the second. By the time September rolled around this year, the second pair were fit for the pit (gold stars for anyone who gets this reference). Especially up close. But with nothing to replace them, I kept on wearing 'em. So, as I mentioned before, while on my medical trip to Ontario I found a new pair of ballet flats that blew these babies right out of the water. While doing a little impromptu shopping with my part-time-hair-model pal, I came upon them in an outlet mall. First, I stumbled upon a pair with a bow on the front. Boo, as that was the ONE thing that I didn't love about my other ones. I may have a penchant for shiny things but I don't dig bows. "Who do I Twitter about these bows? They really need to go." Then, I went to another aisle and - BAM - there they were. Minus the bow! (see how quickly Twitter works? Haha). To my horror, though, there was only one pair left. Upon closer inspection, much to my total surprise, the final pair were my size! With a gleeful giggle, I tracked down a clerk to find its buddy. Like I said, this was at an outlet and the organization of the store left a little to be desired. Just like Cinderella, they fit perfectly and my feet have never been happier. For reals. They sent me a memo. So, without further adieu, I am pleased as punch to present THE MOST AMAZING BALLET FLATS EVER!! SEE! I wasn't lying! Aren't they just GORGEOUS?! Sorry, I got lost in the shine for a moment there. Oh right, so now all I have to do is move to a warmer climate so I can wear them all the time. The Hubby isn't so into the idea, but I'll wear him down eventually. And speaking of "wearing down," these babies are from Nine West and those guys really know how to make a pair of sparkly flats last longer because they have a little heel. Not one little piece of fabric touches the ground when I walk. Nicely done, Nine West. Nicely done. well done!! those are gorgeous!! 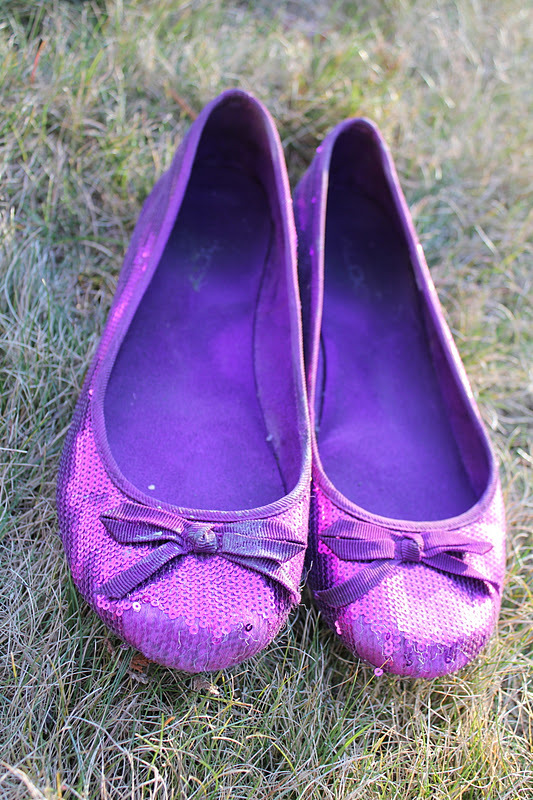 doesn't get much more awesome than sparkle flats!! Thanks Mary! They're like disco balls, but for my feet!